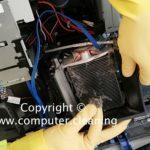 Monitor cleaning is a specialist service that involves the removal of dirt, dust, and fingerprints from the computer screen. 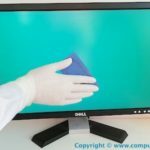 A deep clean or spring cleaning process of a monitor, LCD, LED, VDU, or flat-panel display screen is accomplished with the help of microfibre cloth, screen cleaning wipes, anti-static brush, and monitor screen fluid spray. 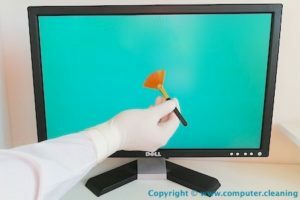 A thorough but gentle procedure is carried out on the front and back of the monitor screen to remove dirt, dust and residues, and to give the monitor panel a fresh look and to restore the picture and visual quality of the screen. Visual Display Units (VDU) and Computer Monitor Screen are often left uncleaned leading to loss of character definition and unwanted distraction. Many cases of error and eyestrain are caused by dirty screens. 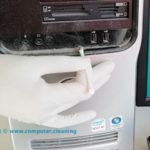 Computer Cleaning provides a quality cleaning service in London and across the UK, that ensures that your computer monitors and VDU screen are cleaned regularly to the highest standards and low cost. 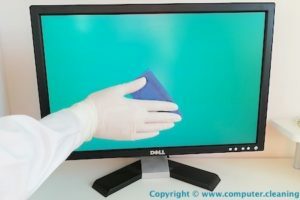 When cleaning a workstation, it is essential that sufficient time is spent on the computer monitor and display units, to ensure that all the grease and dirt is fully removed. Cleaning materials are used, which conform to the highest food – use standards to ensure operator safety. The cleaning fluids incorporate an active biocide, to prevent any cross-infection. VDU screens are cleaned with a specially formulated cleaning fluid, which will leave your screens crystal clear. • Do not use any cleaners, such as acetone, which contains ketones as they will destroy plastics and the anti-glare coatings quite quickly. • Do not use ammonia cleaning products. • Do not allow liquid to run into the edges under the frame of the screen. • Do not use Kleenex, paper towels, sponges or other coarse shop towels! These materials may contain abrasives that can scratch the surface coatings as well as leaving lint on your screen. • Work with the screen display turned off and cool. • Wipe the screen using light pressure. • Use clean, lint-free cotton, microfiber cloths or low-lint wipes. • Use water, diluted isopropyl alcohol (in moderation) or, ideally, a specially formulated, low impact screen cleaning solution. • Apply solutions to the cloth then wipe the screen with the cloth to avoid the possibility of excess moisture running into the frame of the device. • Use a vacuum with a clean soft brush attachment or a clean soft brush to remove dust from edges or corners. WARNING: Before cleaning the monitor, unplug the monitor power cable from the electrical outlet. • To clean your anti-static screen, lightly dampen a soft, clean cloth with water. If possible, use a special screen-cleaning tissue or solution suitable for the antistatic coating. Do not use benzene, thinner, ammonia, abrasive cleaners, or compressed air. • Use a lightly-dampened, warm cloth to clean the monitor. Avoid using detergent of any kind as some detergents leave a milky film on the monitor. • If you notice white powder when you unpack your monitor, wipe it off with a cloth. 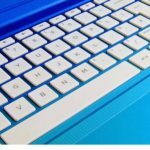 • Handle your monitor with care as a darker-coloured monitor may get scratched and show white scuff marks more than a lighter-coloured monitor. • To help maintain the best image quality on your monitor, use a dynamically changing screensaver and turn Off your monitor when not in use.